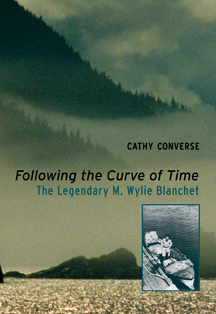 In Following the Curve of Time, Cathy Converse retraces M. Wylie Blanchet's travels to remote anchorages, and First Nations villages and along the unique British Columbia coastline to learn more about the life of this very private woman who has kept readers and boaters captivated for decades. 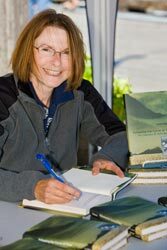 During the 2008 BC Civic Day we had the pleasure of meeting the author of "Following the Curve of Time", Cathy Converse at Telegraph Cove (Northern Vancouver Island) during her book signing. Cathy Converse is also the author of MainStays: Women Who Shaped BC and, with Beth Hill, The Remarkable World of Frances Barkley, a BC best seller. She has taught sociology and criminology at Camosun College and served as chairperson of the Social Sciences Department. Her passion is to tell the stories of women who have always been at the forefront of making history and involved in the shaping of their communities. She and her husband have cruised the west coast for 20 summers, always with a copy of The Curve of Time aboard. When we asked what motivated her to retrace the steps of Capi and her five children, then write a book about it from her home in Victoria, British Columbia, this was her explanation. "I have always lived along the shores of the Pacific Ocean and have spent years sailing the coast, but when my husband and I set out in Ikkutut in the summer of 2006 to revisit all of the places Capi had written about, I grew to appreciate her strong spirit even more. 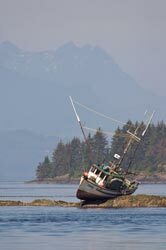 The coastline of British Columbia can be unforgiving; it is littered with rocks, underwater mountains hide just under the surface, strong currents, swirling eddies, reversing falls and extreme tides can catch the unwary sailor, and in the summer months fog can sweep the bays and inlets in the blink of an eye, presenting an extreme danger to marine traffic. For the sake of adventure, love of nature and financial necessity (Capi had to rent her house every summer to help tide her family over for the winter months) Capi took her five children and dog in a smallish, lightly built boat cruising up and down the coast for 12 years and then wrote about her adventures in The Curve of Time, which has become a classic". "When I took on the task of writing about Capi Blanchet, I was very excited because The Curve of Time had always been aboard my boat and I often referred to it as I cruised up and down the coastline of British Columbia. Whenever I would sail into a small bay or cove I would wonder if this was the place where Pam the dog stood sod-soaked up to her neck in the ocean for the night, because a hungry cougar stalked her, or perhaps the place that Capi rescued her children from a bear when they found themselves caught between a sow and her cubs. Every time I work my way around Sechelt Peninsula I think of Capi's wonderful story of Henry, the little Orca whale, who got trapped behind the fearsome rapids in Skookumchuck Narrows". Muriel Wylie Blanchet, better known as "Capi," was a woman ahead of her time and writer of the Canadian classic The Curve of Time. 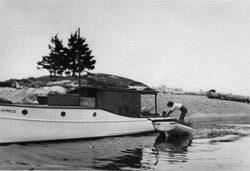 This account of a young widow and her children who cruised the beautiful islands and inlets of the West Coast in a small boat during the 1920s-30s has been a bestseller since it was first told. But little is known about what inspired Capi's spirit and resilience. What tied Capi to the West Coast, despite her upbringing and family ties in Eastern Canada? What made her see possibility in travelling the course by boat? 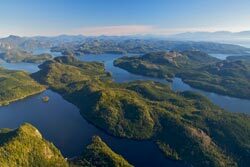 While Capi and the children spent most of their time in and around Desolation Sound, they did venture father up the coast. Having read about First Nations villages, they were anxious to see the lands of the Kwakwaka'wakw before they disappeared. 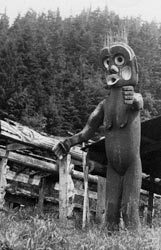 The Kwakwaka'wakw are a water people who live along the northwest coast of British Columbia; it was the groups that inhabit the Broughton Archipelago that Capi wanted to see. When Capi and the children first turned in to the mythic lands of the raven and eagle, they entered a maze of islands filled with cul-de-sacs, dead ends and a confusing network of channels. Time ceased to exist once they entered the archipelago. They discovered remnants of the past existing side by side with viable working communities that appeared to slip in and out of history with graceful ease. Capi's reminiscences are important because she captured a people in transition. She wrote of seeing human bones and burial boxes, ceremonial spoons and bowls, weathered totems, no longer tall and straight but tilted and falling. She found a blend of twentieth-century clapboard houses and modern stoves alongside traditional longhouses and ringed stone firepits. Much has changed and yet much has stayed the same since they carved their dreams into the fabric of time. Standing on the beach at Gilford Island, on the edge of the Great Bear Rainforest, it is tempting to step onto the curve of time where past and present are no more and imagine Capi and the children coming face-to-face with Dzunukwa, the Wild Woman of the woods. Dzunukwa was a fearsome creature with a long, red-painted body and huge black head, heavy brows and protruding lips giving her a cadaverous appearance. It was said that she ran through the forest collecting children to take them home to eat. Young David was wary of this giant denizen of the forest and kept far away from the reaches of her arms, lest she eat him, too. Dzunukwa is now gone, replaced with tall grasses, but her spirit still whistles through the woods. By the mid 1940s things began to change for the villagers. The children on the islands were left without a teacher, and the residents had no medical support. Some of the villagers left. By the late 1960s many of the villages were empty and most of the houses had been vandalized: bed frames rusted on the beach; doors were missing from their hinges; windows were broken; insulation hung from the ceilings and fell in great wet lumps onto piles of clothing; and broken dishes were scattered on the floors. The great totem poles have given way to tall grasses, blackberry bushes and honeysuckle vines, but sometimes the remnants of a cedar carved sea lion can be found in the grass near where the Big Houses once stood. Now kayakers and cruisers come to walk upon the grassy fields, hoping to catch an image or impression of the ancient stories, the dancing and gift-giving that once took place in the big plank houses that overlooked the ocean. It is impossible to spend any time cruising along the coast without being affected by the experience. Lazy summers surrounded by the towering trees, high cliffs and fjords of the rainforest, moving among the marine life, marking its habits and rhythms in a life dictated by the weather and tides, alter a person's sense of self and place in the world. Cruising teaches humility, and the elements caution against impatience and flippancy. This makes some people a little less anxious, more peaceful, less needful of urban trapping and large groups. It made Capi and her children stronger, more self sufficient and less tolerant of artificial conventions. 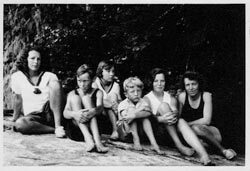 By 1937 Capi's children had grown up and the long summer cruises aboard the Caprice had ended. [The Curve of Time] is now joined by Converse's formidable Following the Curve of Time: The Legendary M. Wylie Blanchet. Part biography, part love song for the coast, all tribute, Converse's recent book shines light on the "shadowy protagonist" of The Curve of Time... and elegantly brings the book's places and people up to date. When Pierre Berton-bless him-said, "Good books are written by people that need to write them," he might have been talking about Cathy Converse. Having immortalized the life of Frances Barkley-the first white woman to reach Canada's west coast-Converse now deserves credit for collecting just about everything there is to know about M. Wylie Blanchet, author of a classic coastal memoir, The Curve of Time.